…[T]he adult/caregiver must supervise the child during the entire library visit by keeping them within their line of sight. If a child under 10 years of age is unattended and an adult/responsible caregiver cannot be located within 5 minutes, library staff will call the Beaverton Police Department. I guess if kids want to read, they’ve got their phones. A program my son used to go to as dropoff now requires a parent to be with him. And definitely, in our town, the library is mostly for the preschool set. Don’t they realize that after a certain point, not only do we not need to supervise their every activity but maybe we don’t even want to? Why should I give up two hours on a Saturday, sitting in the library waiting, so my son can use a 3D printing program? Isn’t it okay for us to have separate interests? Apparently not. Here is the entire policy. Note the fact that, as is common, a rule that constricts a child’s freedom, as well as parents’ ability to decide for themselves what age their kids are capable of doing something in public, is compromised for safety concerns. This is how we get parents arrested for letting their kids play outside, or wait a few minutes in the car. It’s the bulletproof excuse that hijacks freedom. Children of all ages are welcome in the library. Doesn’t sound that way. I went to the library by myself at age 9. Children under 10 years of age must be accompanied by an adult/caregiver at all times. * This means the adult/caregiver must supervise the child during the entire library visit by keeping them within their line of sight. If a child under 10 years of age is unattended and an adult/responsible caregiver cannot be located within 5 minutes, library staff will call the Beaverton Police Department. When Library events require children to attend on their own, children shall be brought to the room immediately prior to the program and immediately met outside the room at the program’s conclusion. Library staff is not responsible for the supervision of children in any area of the library at any time except during library programs where parents/caregivers do not attend. The Beaverton Police Department will be called for unattended minors at the time of Library closure. The library seems to interpret kids left alone at the library as child endangerment. That sounds like a scary library! I get that some children can be ill-behaved. But why punish ALL children who want to come to the library by making access taboo till double digits? Teach, punish or ban the kids who can’t control themselves, and let the other kids come in and, you know, read. As someone in your town once said: Just do it. Spain to Parents: Let Your 6-Year-Olds Walk to School! I see the potential for a cottage industry: making false IDs for nine and ten year-olds showing them to be eleven. You know, if I were the Beaverton Police Chief I’d put my foot down here. I’d just tell the library staff that they need to deal with unattended 9-year-olds and their parents themselves. Primarily because the police have their hands full dealing with drug pushers, domestic violence cases, robbery, assault and battery cases, murderers, speeders, drunk drivers, etc. I realize the police are there to protect and to serve but they’re much more effective when they prioritize who and what situations they protect and serve and not get bogged down with the petty little stuff! Well you know libraries can be dangerous, especially the restricted section at Hogwarts, it’s best to go at night with no supervision. But then those kids are over 11 I guess it’s ok. I got a library card at age 8, which my parents had to sign. I don’t remember either of them ever setting foot in the library itself. We would not have ever gone to the library. From ages 7 or 8, we’d bicycle the two miles to read and check out books. Our mother never learned to ride a bike. I would bet anything this has to do with this: “It is the responsibility of the accompanying adult/caregiver to ensure a child’s appropriate behavior” rather than child safety. But to avoid angering the public they couch this in terms of the children’s safety. I can easily imagine some people leaving their kids there as a babysitting service, kids who are unable to behave on their own, unsupervised. This happens in bookstores and in shops and all sorts of places you wouldn’t imagine. Libraries have changed. At least the main ones where I live on the East Coast and where my mother lives in Arizona are full of people and children talking at the tops of their lungs. There is no more quiet at the libraries I’ve seen. kids are running and climbing everywhere. I can imagine people thinking they can just leave their kids their and come back later. Apparently this library doesn’t trust its own staff to deal with the dangers inherent in exposing children to the written word, which says more about its staff than about the children or their parents. Would you want to work in a place that considers you to be an incompetent idiot who can’t even protect children from the dangers of reading (papercuts included)? Kirsten – good theory, but if that was their motivation the age limit would have been 16 or 18. these people truly think that an unattended child is in immediate danger of omnipresent predators. Even being out of immediate sight of the assigned protector puts them in immenent peril. As far as Rule 5, it states ‘unattended minors,’ not just those under 10. I’m sure that this was written by well meaning, if misguided, members of the libraries’ staff. As written, this would mandate a call to the police at closing hours for a 17-year old who drove himself there . Not only is the issue the parent having to accompany the child to the library in general, but the parent can’t go find his/her own books while the child does the same, unless the adult and children sections of the library are near each other with clear sightlines between all the shelves (doubtful). So mom has to go with kid while he does his thing, then kid has to go with mom while she does hers. What a pain. I wonder what the Beaverton library is like in practice. Will the staff really call the cops if a 5yo wanders away from his/her keeper? Or will the staff call the cops if the child is creating problems? Will the staff even notice that the child is out of his parent’s line of sight if the child is not causing trouble? I’d love to see a kind of literary flash mob, where dozens of kids walked or biked to the library, went inside, found a book, and read. The icing on the cake would be if the kids arranged for local newspeople to be there. Remember this is the same state that has a law that those under age 10 can’t be left unattended if it’s deemed to have endangered the health and welfare of the child (scary in its subjectivity). Perhaps we have a domino effect here, although I agree with others who pointed out the library rule might have instead come from library staff feel they have to supervise unattended children. I recall the going to the library as a kid. The kiddy section was on one side of the library… everything else was on the other. We’d go the library as a family (preceding a visit to the ice cream parlor), kids would go to the kiddy section to find books, play with heavy wooden blocks, look at the library pets, etc., while my parents would go elsewhere. If we needed our parents, we would wander to the general area our parents said they’d be. We would find them. Ah, I miss the 90s. Is this real or is it just a backside coverer to use in the rare event of badly behaved children? In this great land, we get to get involved and deconstruct laws we don’t like. Join the library board. Get other parents to help. If the library is all about preschool, how weird is that? Babies don’t actually read books in my town. Are the little ones so accelerated in Beaverton that the library is actually all about them and their head start to Stanford? Bless their hearts! Do we assume that between ages five and ten they have actually outgrown the need for libraries?. Or do they attend schools so well endowed by Nike et al that public libraries are redundant? Our library is a function of the Town, so we get to vote. Kids come and go. There must be something wrong out there in the Wild West. So, a lady came in, the only patron of the entire establishment, left her child in a convenient place, walked into the next room and browsed books. Obviously, the child was under supervision from at least one employee. She still threatened to call the cops, because everyone knows an unattended child vanishes in a puff of smoke if you take your eyes off of them. Or something. Just north in Vancouver, WA they have a similar policy. In 2012, I took my 3 very excited daughters to the brand new library. Many stories tall, each genre on it’s own floor, but I was yelled at by security that I had to be on the children’s floor with them within eyesight at all time. All the children’s activities were going to waste because I couldn’t fit through them, built into a maze, and if the kids have to be in my line of sight….y’all built the wrong activity structures! No longer could I browse the stacks for my own books, while they browsed for theirs, they had to stand next to me and vice versa. Took the joy out of going to that library! Instead, we visit a smaller branch where they know that kids need to be kids and learn to be on their own! With rules like the Beaverton library, how would stories like Roald Dahl’s Matilda ever happen? Sweet librarian Mrs Phelps is the first person to encourage Matilda’s love of reading and to hand her her first story for adults. Matilda is just four years and three months old, and the story Mrs Phelps picks is Great Expectations by Charles Dickens. But at Beaverton, Matilda wouldn’t even get the chance to go through the door. Sight lines? Am I expected to have x-ray vision through bathroom doors? Or is the expectation that they have no privacy or expectations to behave and follow rules as young adults? Sight lines? For 9 year-olds?? For kids that read chapter books like Matilda? With insulting policies that discriminate against good kids who should be in libraries and don’t need to be living in a constant anxious state of sight lines, is there any wonder why 10 year-olds are more likely to die of suicide than a car accident? All of these articles are so depressing. We can do so much better for our kids. The specific danger(s) isn’t mentioned, but libraries must be extremely risky in Oregon. Two things. First, Beaverton isn’t “actual Niketown”. Nike is outside of Beaverton and intends to stay that way, they have spent a lot of money in legal fees fighting annexation. Second, I grew up in Beaverton, and my mom said “go to the library” a lot. This is the same as before… the key piece of the puzzle is policy #4, everything else is coming from that. If your kid is under 10 but acts responsibly, the librarians aren’t going to card him or her. But if they are a disturbance, and unaccompanied, Something Will Be Done About It. 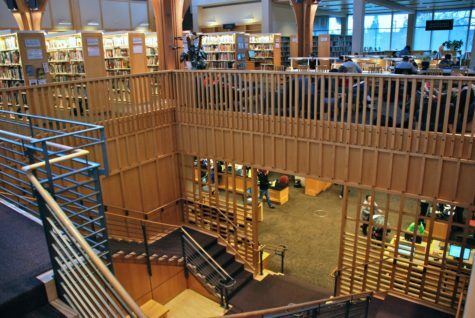 The Washington County Library system (of which the Beaverton city library is a part) is AMAZINGLY child-friendly. I bet if your letter writer had actually gone and talked to a supervising librarian instead of writing to you, explaining that yeah, the kid’s only 9 but he can handle himself in this environment, and he has my cell number if there’s a problem, is it OK if he stays without me, there’s be no objection. I’m pretty sure you’ll find a substantially similar law in the other 49, if you look. ” If your kid is under 10 but acts responsibly, the librarians aren’t going to card him or her. But if they are a disturbance, and unaccompanied, Something Will Be Done About It. Sadly, likely not true. For one thing, a library is a large public enterprise with a fair number of staff members. I guarantee you, there’s at least one officious employee on staff who’s going to call the police when a well-behaved kid is out of a parent’s sightline because them’s the rules and people aren’t supposed to break the rules, goldarnit. And by the way, I worked in a public library through high school. I assure you, we had several librarians who would certainly have been sticklers for the letter of this law. In fact, I think in almost any random collection of employees you’re going to get a few such. Anyway, if that were the purpose, all they need is rule #4, and as Lenore says, enforce it by kicking problem kids out. Creating rule #2 instead is the inappropriate thing here. Good point. Besides the nuisance factor, I guarantee you it’s better for everybody if I don’t have to drag my son with me downstairs to the adult non-fiction section with me to pick up a cookbook or whatever. Yes, he knows not to yell in the library, but while he does pitch his voice appropriately for the children’s section, he’s certainly not as quiet as the adult section requires. Thank goodness James stopped by to correct us. “” If your kid is under 10 but acts responsibly, the librarians aren’t going to card him or her. But if they are a disturbance, and unaccompanied, Something Will Be Done About It. It’s not complicated… some people use the library to store their children. Most of the children are fine; they’re either in programs where they’re supervised by someone whose job description includes “supervises children”, or they behave properly when unsupervised. But some do not. A library is a great place for children who want to read books, or participate in scheduled activities. It is not a good place for children who want to run and play. The Beaverton library is located literally across the street from a park. You know who took over the old library space when the new library opened? The Police Activities League. If you’re incorrect by mistake, that’s a mistake. You’d rather be incorrect on purpose. Why is that? I don’t think your first sentence is actually true. Or if so, I’ve never seen it – and as I said, I used to work in children’s department of a public library. Yes, we had misbehaving and trouble-making kids, but they were generally kids whose parents had brought them to the library – often to make them take out books they’d then be made to read as an assigned chore, against their will. On the other hand, my siblings and I used to go to the library on our own almost every day in the summer, because we liked reading. We did crazy, unsupervised stuff like listen to audiobooks on headphones and discover new authors to read. We never caused trouble: guess why? Because we were bookish kids who liked doing library stuff. That’s why we went there. What’s the likelihood that kids who don’t like to sit and read will choose the library as a destination to go to on their own for fun? Or agree to let their parents leave them there? You may need to be more specific about what you mean by the “it” you’ve never seen. I’m going to take a stab at guessing, but I might be way off. Our libraries (here I’m referring specifically to the Washington County library system, of which Beaverton is a member) runs a LOT of services aimed at children. 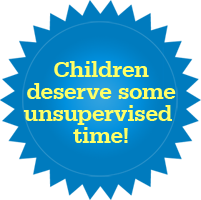 Most of the programs include someone whose job description includes “supervise children” during scheduled times… Outside of those activities, however, there is NOT someone in the children’s section whose job is to supervise children. Parents are expected to supervise their own children. This presents some obvious challenges… the “children’s” section targets toddlers to first-graders, basically… books that will be read to the children. Next to it, they have “early readers” and “young adult” sections, which are also “children” if you define “children” as “minors”, but they are not the same… they have 5-foot shelving instead of 3-foot shelving, and they contain books that children would be expected to read for themselves. A parent who came in with multiple children might easily find that each of their children wants to look at items that are in different sections. This is why the library offers programs that include supervision of children… Parents can come in, drop their children off at the appropriate supervised activity, and either supervise the children who don’t have an interest in the supervised activity, or go look in the regular sections unencumbered by needing to supervise children. (Parents who read have children who read). But… there are also times when there isn’t a children’s program running. Kids who are the type to go find something that interests them, sit down, and read while they wait for parents to return… well, they sit down, read, and wait for their parents to return. Some children, however, are NOT that type. Taking them to a library will not magically turn them into that type. Some parents have children who fall into both categories. Some children fall into both categories, depending on a multitude of factors. And, although it’s fairly rare nowadays, sometimes parent have charge of children who are not their own. Any of these can lead to having kids who are less interested in being in the library than in something (anything) else. Obviously, these behaviors are repressed by parents and (occasionally) by staff. Sometimes it’s a gentle corrective action (“please don’t run in the library”) and sometimes a more forceful (“where’s your mom or dad?”) but it usually doesn’t take much to restore order. It’s those other cases the library wants to prevent before they can happen. I’ve personally seen a kid climbing the bookshelves because bored. I have to agree with James on this one. I haven’t been to the Beaverton Library for a couple years (although I was at a meeting this week across the street) since my library, also in the Washington County Library system, is a lot closer than Beaverton. I assume my library has the same rules, although I’ve never checked. Washington County Libraries is a GREAT library service. They have wonderful activities and selection for children. They have frequent family friendly events and events for children of all ages. I’ve considered moving across county lines but the wonderful library system is one reason I do not want to move. The librarians know me by name, they know my kids, there is a special person whose job it is to run activities, and everyone is extremely helpful and polite. I often leave my young children in the children’s area while I check out a book, get something on hold, look for something, etc. and no one has ever complained or threatened me about calling the police. My children use the bathroom by themselves and the librarians know this and have never hassled me about that either. (I once couldn’t find my five year old and the librarian mentioned he went to the bathroom, no big deal to either of us.) I’ve even left my child at story time while I went outdoors to be with the baby who didn’t want to sit for thirty minutes and no one bothered me about it. My kids are pretty well behaved and I assume no one cares so long as they are doing what kids in a library are supposed to do – look at books, put together a puzzle, etc. I really do think it is a rule to deal with unruly children. My twin boys are age 6.5. I’ve started experimenting in letting them do things themselves (at their initiative). Yayy! Nothign bad happened on any of the three cases I can remember. They wanted to buy some candy at Star Market, which was up a flight of stairs. I said, Hey go do it, here is a $1.10 each (which I knew to be the cheapest variety of gum). I stayed outside reading my book. From reading this blog I wondered if the cashier would refuse to sell to them since they were unaccompanied. They returned jubilant and flushed with success. The candy cost more than I had given t hem but the cashier let them have it! I took the twins to the kids section of the library and sat down with my reading. Yeah, I wanted a few minutes to catch up on Time Magazine. The twins like to keep me in their line of site, but this time went off a bit and found books and I tracked them auditorally via their giggling. Soon they enticed a teenage girl to talk with them. They begin plying the girl with questions. They asked her to read to them. She appeared to be quite surprised that some 6 year old boys whose mother wasn’t hovering and apparently was no where to be seen wanted her to read to them. But she started reading to them. Finally the teen girls’ mother arrived to collect the teen girl. The teen then saw me and told me 10 times how adorable my children were. Library win! AND the stories just above with the twins. We all need more of those getting-to-know-our-neighbors encounters. The original topic makes me sad, though. We moved when I was about 8 years old, and the best thing about the new apartment was that it was two blocks from the library, and I was allowed to go by myself! The first thing I thought of when I saw the title was that Oregon is where Beverly Cleary is from (She’s the author who gave us Ramona & Beezus, Henry Huggins, etc.) and how disappointed she’d be that children today can’t do the kind of simple things her characters did. If they’re afraid of being sued if a child is injured, post a notice on the door saying staff is not responsible for children. If behavior is really the problem, make kids take a little class in proper library behavior to get their cards (and revoke them if necessary). But don’t punish the good kids, or restrict the parents who have weighed the tiny risk of their child being snatched from the library against the very large benefit of their child growing up surrounded by books. The point I’ve been trying to make is that they don’t. I’ll retract this statement if someone can tell about the time the cops were called on their unaccompanied kids in the Beaverton library, when said kids were well-behaved and orderly even though unsupervised. Here you go, people who like to whine about me sharing my opinion as a fact. Prove me wrong. when our library first opened a few years ago, they didn’t have a policy. Then, they ran into a little difficulty so they created a policy that you need to be 10 (which is not much of a hardship since we are in a really rural area and it would be extremely difficult for a kid under 10 to get there on their own) but overall, it hasn’t been enforced. .Even when my kid was 7 and I was going to be late for aftercare pickup, I had them drop her at the library (I called to be sure that it was ok for her to be there unattended and they were fine with it). She read until I got there 30 minutes later. Now they have a new “teen” section — open to kids over 10. It’s a great place for the kids. There’s a rule in case anyone abuses the issue but the librarians are so cool and so interested in getting the kids to love the library and reading that I couldn’t imagine a more welcoming place. On early release day, kids from K-8 walk over from the school and are entertained for with a movie and popcorn (and no parents or chaperones) for a few hours — a HUGE blessing for working parents. Sometimes rules are helpful to fall back on when inevitably someone abuses the system. That would make a great science fair project for an elementary school student. The effect of observation on the persistence of children. Man are they going to get mad when I go in the men’s room and make sure that my child’s feet are in line of sight. Because you know, that boy just refuses, (rightly so!) to go to the women’s room. Oh, wait, I bet they didn’t intend for this…..or dad’s following their daughters to the women’s room either. They might want to rethink this. Right now, my youngest is supposed to be picked up within 5 minutes of his last class. Sometimes, as I have 3, who sometimes have appointments, that is not possible. So they have to go to the library, that is open longer than their schools, and wait for me to pick them up. (This involves riding public transit.) I have never gotten anything but “Your kids are so great!” Had I gotten something else, I would reconsider. At those ages, I never had to be “stored” anywhere if I was in my hometown. I could be at home without parents present, certainly for the length of a few appointments, or walk to the town square (including the library), or to a park, or to a friend’s house. I could go just about anywhere adults could go, apart from a few obvious exceptions like bars or bordellos. It’s the no-child-left-unsupervised-at-any-time ethos that has created these problems, where there were no problems before. They apparently do not have kids. It would be impossible to keep an eye on all four of my kids at the library. As soon as we hit the kids area they each bolt to their favorite section. I think it’s fantastic! I can’t imagine trying to keep all of them on the same aisle because with the height of the shelves, even one aisle over is out of sight line. I am SO glad our library allows kids to be on their own. BL – I don’t get the impression that CrazyCatLady sends her teens to the library because she doesn’t want to leave them home unsupervised, but just to get them to leave the house for a spell. Having a tween who will sometimes not step foot out of her room all weekend except to get food, I can understand the desire. Where did kids like that come from? That would have been considered pathological when I was a kid. And please, let no one blame it on “technology”. The technology today is mobile – you can take it anywhere. Telephones were all landlines when I was a kid; televisions were fixed too. It made more sense to hole up at home in the old days, if you were fixated on technology. Now you can take your “phone” anywhere and can even watch netflix and other TV-like things anywhere. So why stay home? Sigh…..libraries are such dangerous places. You bet they are. They’re full of conflict and drama, especially in the fiction sections. Nah. I’d say some kids need a break. Or they’re into a very good book. Or art projects. Redecorating their room. My youngest spent days over the winter on art projects- she would do diy projects all.day.long. Happily. My mom always said, Don’t try to make a happy kid happier. I agree. Houston Public Library seems to have a somewhat sensible policy. Under 7 must be accompanied, 7-14 yrs can be unattended for up to an hour but not at closing time. People 15 yrs and older can be asked to leave the library if disruptive. Attempt made to reach parent first and if that fails, then police called. The only thing, the city has curfew hours during school times and the library states that unaccompanied minors are not allowed in between 9 and 2:30. What about those homeschooled? Hopefully someone with that situation could speak to the library or the truancy dept and possibly reach an understanding. I think part of this is that the library can’t just kick a disruptive kid out of the library, like they did when we were kids. They are probably afraid they would be sued or arrested if they did anything about an obnoxious kid. My local library system used to have a rule, I think for kids under 12 being left alone for more than 15 minutes or something. At some point, the rule was changed to something more open-ended, and it didn’t say anything about calling the cops. Of course I thought the under-12 rule was dumb and I was relieved to see it changed. At another branch, however, after their robotics camp, my kids were told that they were not allowed to go to the kids’ section of the library until their parent arrived. My kids called me and I said I was on my way. In the interim, the kids’ librarian stepped in and ushered them over to the kids’ section, where they were happily using the computers when I arrived. So I guess the rules were a little foggy at that branch. At yet a third branch – the one closest to our house – I regularly leave my kids for reasonable stretches of time (it’s too far for them to walk home). So far nobody has said anything. My kids know that if they act like idiots, they will have consequences, and they do have the option to leave and go to the nearby park if they feel the need to run or yell. Not that it’s so quiet in the library – the little kids with moms present tend to be quite loud – but that is apparently normal nowadays. I hope the threat to call the cops in that Oregon library is just an idle threat. It’s idiotic. I hope someone complains. Or is the library publicly saying that it is a dangerous place for kids? If so, the library needs to fix that problem, because it’s a public place that needs to be safe for everyone. For those saying this rule won’t actually be applied to “good kids” – it’s still a big problem, because many parents will read that rule and just not take their kids to the library at all. It’s stressful to put your kid in that kind of situation and wonder whether the cops will actually be called. I have had the cops actually called on me for making a valid parenting choice (and my kids were doing nothing wrong). Although the cop didn’t do anything to me, that potential has a chilling effect. A library that actually cares about all kids getting to read will develop policies that make this easier, not harder. School-aged kids need to be able to come and go at the library like we used to. Rules to prevent behavior problems need to target bad behavior. Wow. If you go into the children’s section of our local (low income neighborhood) library any time between school dismissal and closing you will see about 25 kids using the computers, reading, or playing games. Very few parents. There are two staff members there as well at the checkout desk. I love that the library is another safe place for children to gather after school. Maybe the Oregon rules are a casualty of privilege? If you look a little closer, you’ll notice that the only “threat” to call police is if the child is still unattended at closing time, at which point the kid is going to be OUTSIDE the library. Now, if they come up on a kid still in the library at closing time, if the kids says, “Oh, it’s closing time? Guess I’ll go home then.” that’s going to produce… nothing. The kid leaves just like all the other people, and the library closes. It’s only an issue if it’s time to close the library, and there’s a kid still there who expected to be collected by a parent. This is the actual policy on calling law enforcement. That’s what rule 5 says. But rule 2 indicates police will also be called at any time if an adult in charge of an unattended child (under 10) cannot be located within 5 minutes. And it applies for “the entire library visit” (their words), not just at closing time. “That’s what rule 5 says. You didn’t look at the real policy, did you? Adopted by the Library Advisory Board, January 2006 Updated October 2015” is unreal? Well, you live there and I don’t, so you may have inside information, but it looks like they went to a lot of trouble to publish an unreal set of rules. Once I asked some librarians how about having tons of unsupervised kids, and their answer surprised me. There was a nice little, tiny library in a town where i used to work. There were a lot of hard working, but not very well off families who lived there. After school, tons of kids would descend on this library. It Seemed like a hundred kids ages 8 to 13. Their parents couldn’t afford after care, so they went to the library after school because it was a safe place to stay. The librarians said it was difficult sometimes, and they had to be strict about some things, but other wise they LOVED it. How often do you get a chance to instill a life long love of reading and libraries with a mostly captive audience! They had some programs, and tutoring, but mostly a huge youth section. Time passed, the little library continued to serve the community, and now they have a new bigger library with more resources because the community voted to support the library that served them. The libraries that forget why they are here will languish. The Libraries that love to cultivate readers will flourish. Personally, I believe that many here engage in a good bit of revisionist history when discussing their childhood, but maybe you really did wander outside in all kinds of weather and only know people who did the same. In the world that I grew up in, it was very common for kids to regularly just hang out at home, especially in the tween/teen years when they were too old to want to hang out at the playground and too young to drive themselves anywhere. I never lived anywhere where I could get anywhere fun or to all of my friends’ houses by myself. We had plenty to do in the neighborhood when we were little, but by tween years, we wanted to do things, not just hang out outside. And we wanted to do them with our friends, and not just the other kids who happened to live near us. The library, mall, skating rink, movies, etc. were all way outside my ability to get to on my own and most of my friends lived miles away. Unless a parent drove, we were stuck doing our own thing and more often than not that meant hanging out in our rooms reading, watching tv, listening to the radio and chatting to each other on the phone for hours. You called it “the real policy”, but it seems that the Safe Child Policy is a separate policy, (though no less “REAL”) and it is the policy that Lenore posted. I’m not going to argue that the policy will/won’t be enforced; I’ll take your word for it since you have experience in the town itself. But don’t pretend that the policy Lenore posted isn’t “real” just because you found a link to another general library policy. Especially when your policy says right there “refer to the library’s Safe Child Policy”!!! Thanks for clearing up the misconception about Nike being outside the town. I was really happy that detail didn’t go unnoticed, without your dutiful correction. We didn’t necessarily go out and stay out in the nastiest weather, but we could get to friends’ houses, the YMCA (open gym) and some other places. And truly nasty weather was the exception, not the rule. You said your daughter didn’t leave her own room but for meals. That’s a big step more isolated than not leaving the house. Could you get to SOME friends’ houses? You can only hang out in one house at a time. Except for the library, I had no easy way to get to those things, either, after 12 when we moved. From 8-12 there was a roller-skating rink I could (and did) walk to. Didn’t anybody in your circle play card games or board games or anything like that? We did. Three more friends and you can play spades or hearts. Two can play gin rummy, or cribbage or backgammon. Gotta love that urban planning. Isolate everyone. Luckily I mostly grew up in small towns designed for people, not urban planners. I wish I could “like” your response 1,000 times. AMEN to libraries that help bridge the gaps for our vulnerable populations and help kids vs.turn them away. I wish our tax dollars went to more programs for youth literacy. I can’t think of a better place for an at-risk youth than a library. We love ours. And I’ve never seen any of these absurd policies. My neighbor is a librarian. She said its not the younger “unattended” children that are problematic. These kids learn the rules young and follow them. Her issue is with loud, disruptive teenagers who should know better but don’t and use the library as their social hangout with bad language and nonsense. She LOVES the bookish kids. It’s older kids (and adults) that create headaches. I’m a librarian, and I just wanted to weigh in that it’s not uncommon for libraries to have this sort of rule. Where I work, children under the age of 10 aren’t allowed to be in the library without being accompanied by someone at least 14 years of age or older. We also have terms in our policies that make it clear the library does not provide child care, nor can the librarians guarantee children’s safety. But the sightlines thing is weird. I’ve never heard of that stipulation, though I imagine if the children’s room is open and connected to other parts of the library, which looks like it might be the case, it may be an effort to cut down on children shouting for their parents. We have our children’s room on a different floor with its own staff and desk, so we have the luxury of letting kids run and speak at child-normal levels (i.e., a handful of decibels higher than what an adult would consider conversational level). That said, the parent does have to be in the children’s room with the child; they’re not allowed to leave without taking their son and/or daughter with them. Most likely the policy is there to protect the librarians in case of upset adults. You probably won’t find many librarians who strongly enforce it. I was one of those bookish kids myself, and my parents started leaving me at the library for short periods of time, starting when I was about eight. It was my mom’s idea–my dad was against it, because, “the people at the library aren’t there to watch Emily.” My mom argued that, “Emily doesn’t need to be watched.” My mom won, and nothing ever really went wrong at the library–I’d just go, find what I wanted, sit and read for a while, and then borrow whatever books I wanted to borrow. I was actually allowed to be at the library alone (although I had to be dropped off, due to distance), before I was allowed to be home alone, because, in many ways, libraries are safer places than homes. Kids don’t have access to knives, power tools, dangerous chemicals, liquor cabinets, or kitchen appliances that can cause fires, at the library. They do have access to the Internet there, but it’s usually supervised, either by roving librarians, or by Net Nanny software or similar. I know, it’s not the general public’s responsibility to teach kids responsibility, but the thing is, when you hover over kids constantly until they reach the magic age when they’re finally “old enough” to do XYZ, they’re probably not going to succeed, because they haven’t been allowed to do any of the intermediate steps to get there…….and then, when they can’t do it, it’s going to become someone else’s problem. That “someone else” could be the R.A. in the university residence who holds a “how to do laundry” tutorial session every September (true story; the R.A. in question was a friend of mine), the first responders who rush in when a young person causes a kitchen fire from cooking, or gets salmonella from eating chicken that’s still pink in the middle, or gets drunk and passes out. The other thing about the library specifically is, reading is often a solitary activity, and once kids are old enough to read silently on their own, they don’t want to be hovered over and “supervised” when they’re trying to read–I know I didn’t. So, suppose you’re nine years old. It’s Saturday morning, and your parents ask you if you’d like to go to the library. You like to read, but you know that, once you’re at the library, you can’t browse or read without a parent right on top of you in the children’s or young adults’ section, and then you have to stay right next to your parent (but be quiet) while they browse for their own books. You’d love to be able to just go and pick out what you want, at your own pace, and sit and read, but that’s not allowed for another year. This makes no sense to you, because you know proper library behaviour from library time at school. So, instead, you say no to the library visit, and stay at home and play your X-Box. By the time you’re old enough to be left alone in the library, you don’t want to go, because ten is when peer pressure starts to heat up, and the library is “uncool.” Although, to be fair, the library created that reputation for itself, by not allowing kids to be their own people there, as opposed to extensions of their parents or caregivers. I didn’t say that my daughter did this every single day and never interacted with another soul in her entire life. My daughter has a very active social life. She also sometimes spends days doing nothing except hanging out in her room. It is generally when she is lost in a book, but occasionally she also spends a day surfing youtube for the weird videos she likes that I have no interest in listening to and would make her wear headphones if she was out in the living room so she prefers to do in her own space. As a child, I also spent many a day in in my room, coming out only for meals. So did all my friends. I wasn’t much of a phone person, but most of my friends were in their rooms on the phone with each other for hours on end. Here and there. We moved a lot during my childhood. Sometimes I had friends close by and sometimes I didn’t. For most of my teen years, my parents were going through their country phase and we lived in the middle of nowhere. My friends were all at least 30 minutes by car away. And, as a Jersey girl who was suddenly slapped down in rural Georgia, I was extremely pissed at my parents about the whole thing and pretty disinterested in hanging out with them. But that isn’t really the point. You seem to assume that everyone is an extrovert and wants to be with friends all the time. I am an introvert. My hell is having to spend every waking minute of the day interacting with people. I was very social at school, but also very happy to leave that behind and be by myself once school was over for the day. Weekends were hit or miss as to whether I wanted to socialize or not. And happy socializing for me is generally doing something together and not just sitting around chatting. I hate having to conversate all the time. My happiest moment of the weekend was when my daughter, who was extremely chatty this weekend for some reason, left for a sleepover and I had the whole rest of the night alone. Nobody said a word to me for like 14 hours and I was in heaven. But I’m not even sure the room thing is a introvert/extrovert issue. My friend was just complaining that her very extroverted 13 year old is always in her room and they have trouble getting her out to even eat meals. She is generally on Facetime or texting with friends, but she definitely rarely hangs out with her family when she is home. Uh, no. No extrovert here. But (apparently like you) I spent time with a few close friends. An introvert, but not a loner. I was (still am) a bibliophile. Going outside of my room often meant browsing at a bookstore or hours in the library stacks. Which didn’t exclude hanging out with friends, playing pickup basketball or card games or riding bicycles (I also spent time alone riding the bike or dealing solitaire or shooting baskets). Google it. You will find it applies. That being said, I’d be interested to see how this rule is enforced. Regardless, this policy isn’t well written if their goal was to prevent disruptive children from annoying other patrons or people leaving their kids there as a babysitting service. @James the librarian, the variance in acceptable ages is fascinating. In my former hometown, library policy allows for my eight-year-old to read comfortably on a beanbag while I leave the room to get some adult books. In Beaverton, doing just that makes me a negligent parent with a child taking the same risk as playing on a cliffside. The truth is that there is no magic-number age; my son’s 9th or 10th birthday isn’t going to make him any safer or more responsible than he is now. Libraries need to be focusing on behavior, often spelled out in Patron Conduct Policies, instead of hard numbers. They also need to trust parents to know their own children and what their developmentally ready to do, all the while enforcing standards of behavior, just as they do with adults. I won’t even comment on how ridiculous it is to make 14 the minimum age. Another thing–who else here thinks that, the moment a ten-year-old misbehaves in the library, the minimum age will creep up to eleven or twelve, and the moment a twelve-year-old misbehaves, it’ll become thirteen or fourteen, and so on, and so forth, until no minor child is allowed to use the library independently? It’s not that far-fetched; there have been stories here about it happening with airlines, Amtrak, shopping malls, and tons of other places that previously welcomed unescorted young people. @Emily, your point rings dead-on. That’s why they need to be focusing on behavior, not a hard-and-fast-number age. That’s exactly what they do once people are over 18, (I’ve watched a grown man rightfully get kicked out of there), and exactly why there’s a patron conduct policy. As a Beaverton resident, mother, and frequent library patron, I’m among the best qualified to speak to this. (Note that I’m not the mother with the kid who was in drop-off programs, which I was unaware ever existed there). No, I’ve never had the police called on me, but at least one librarian is a stickler for enforcing that line-of-vision thing. So yes, it is enforced. Apparently, my children, all at different reading levels, are forbidden to scatter across the first floor to pick out books. We must all march in caravan to each section lest one of the little darlings act like an unspeakable brat or, despite the ubiquitous surveillance cameras, become a topic for a national talk show. Or they could do the especially unthinkable and, oh I dunno, sit down and read for awhile. ((Forehead slap)). Criticizing a single, particular policy doesn’t change how much we love this library and the librarians and staff who make it possible. It does mean that it may be time to work for some positive and productive change that address the concerns of of both staff and patrons. As a chid-free person, this is a mixed bag for me. On one side, I hate going the library and being beset by screeching children with no parents in sight to control them. I spent my teenage years volunteering with the local library and heard far too many librarians lamenting about how parents used them as a daycare, dropping their child off and then leaving for the day. The kids would get bored and end up causing problems for everyone. On the other, going to the library when I was a kid was one of my greatest pleasures. I loved getting lost in the aisles and sitting there for hours just reading, without my mom hovering over my shoulder and asking if I was done so we could leave. When I was allowed to walk the neighborhood alone, I would always end up walking there. That’s how I got involved in the young adult programs and learned so much about the world. I wish people would work on finding an in-between solution, something to discourage irresponsible people from leaving young children for the day, but allow older kids the chance to be on their own. Maybe ‘parents must be in the building with children under six/seven’? Apparently the library advisory board thinks their library is a place where 5 out of eyeshot of parents is **likely** to endanger the health or welfare of kids under 10. Not just *could* endanger, but is likely… as in more probable than not… to be actively dangerous. What does it have rotating blades at the doorways? Poison snakes imported from eastern Oregon in the non-fiction, and actual serial killers with the horror novels? If it is that hazardous then it shouldn’t be open at all. Likely dangerous to under 10 still means quite dangerous to 10 and up. And if it isn’t *likely* to endanger kids under 10 then the quoted statute is irrelevant. Either way the library board is loudly proclaiming that they are not doing their job.